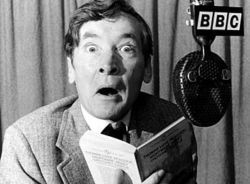 Marking the 90th anniversary of the birth of a legend of entertainment, actor Robin Sebastian exposes his inner Kenneth Williams to introduce a collection of the Carry-On star's radio highlights. Williams On The Wireless, BBC Radio 4 Extra. Please don't let there be too much of Robin Sebastian doing his annoyingly OTT 'impressions'. Update: A strange collection, eg an episode of Just A Minute with Kenny as the host, not a contestant. More over, he was at his best and his funniest telling stories, the BBC must have so much of this archived, but we heard not one. Oh this might cheer me up a bit. Will listen later in between mountain of washing up.